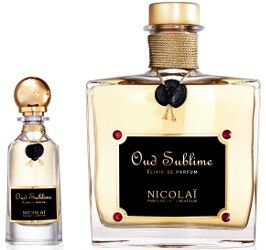 French niche line Parfums de Nicolaï has introduced Oud Sublime, a new fragrance. Oud Sublime follows 2013's Rose Oud and Amber Oud. Oud Sublime is an Elixir de Parfum full of rare natural raw materials. An exceptional fragrance which is totally dependant upon the sourcing of precious rare ingredients like essences of davana, ambrette seeds and above all, Cambodian oud. Like a vintage Cognac with its strong olfactory signature, Oud Sublime is the reserve of great perfume lovers. Additional notes include artemisia, Atlas cedar, patchouli, rose, coriander, cumin, castoreum, amber, musk, incense, styrax and birch. Parfums de Nicolaï Oud Sublime Elixir de Parfum is available in 35 ml (€365), or 500 ml + 35 ml refillable spray (€3260) . Had to look, noticing the new packaging. New pricing to go along with it, it seems. Er, wow. Glancing at the picture, I thought, how wonderful — a 15-mL bottle and a 100-mL, always nice to have a lower-priced smaller-sized option. Then I read the description, and the pricing. It’s mad. Well as long as they keep making their affordable fragrances, I couldn’t care less. Not a great oud fan anyway. Yikes, I did a double take on the set price! Couldn’t believe I read it correctly the first time. ???? But why stop at a half litre? Why not a ten-gallon vat? The cheapskates!